This is the one we recommend for those moderately fit. The itinerary for this Mt Rinjani Classic Trek is softer than the other shorter programs. It start from Senaru, ends in Sembalun Lawang. Highlights are: Mt. Rinjani’s summit (3,726 m), Segara Anak Lake (crater), Hot Springs and Caves. The hike up Mt Rinjani was challenging but accessible for those moderately fit. For those who stay in Kuta Lombok, the pick up time is at 04.30 am. For Mataram or Senggigi area, the pick up time is 05.30 am. For those who stay in Gili Islands, our car will wait at Teluk Nare or Bangsal Harbor at 06.00 am. We will then transfer you to Senaru. Upon arrival in Senaru, meet your guide and porters, get some briefing about the mountain including what do's and what dont's and proceed to RTC to register and get entrance tickets. After breakfast leave the campsite to go down to lake Segara Anak (2,000 m). It take 2 -3 hours trek down through rocky and steep trek trail. A lot of Edelweiss plants (Bunga Abadi) along the trek to the crater’s lake. The trek route in this point is steep and rocky, your guide and porters will assist and give you extra attention. The rest of the day is spent relaxing, swimming in the lake and exploring the caves and pilgrimage hot springs, believed to have healing powers. Camp and overnight by the lake. After lunch leave the lake trek up to Plawangan Sembalun (Sembalun Crater rim 2639m). The trek route in this point is also steep and rocky, your guide and porters will assist and give you extra attention. Reach the crater rim around 5 pm, rest and prepare yourself for an early morning three hours hard climb to the summit (3,726 m). Dinner - Camp (Stay overnight) at Plawangan Sembalun. Wake up early morning and start the trek at 03:00 AM to the summit (3,726 m), a hard trek trail on volcanic screens, some part are steep and loose sand. It takes around 3 hours to reach the summit. 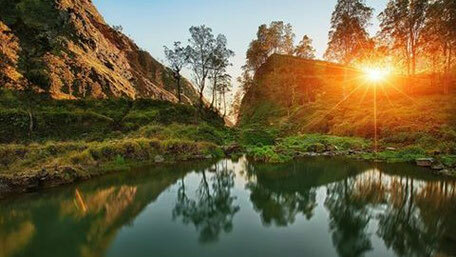 Once there, enjoy proud feelings of satisfaction and the amazing sunrise views across the Wallace Line to Bali, Mt. Agung and Sumbawa. Stay at the summit 30 minutes to 1 hour to enjoy the views around and than going down to the campsite Sembalun crater rim through same route. Rest and breakfast at the campsite, after a well prepared breakfast, with the gentle descent walking to Sembalun Village passing Pos 3 Pada Balong (1,800 m), Pos 2 Tengengean (1,500 m) and Pos 1 Pemantauan (1,300). Lunch served en route.